This ticket allows general access to Sonus Festival 2019 from 18th August - 22nd August. It includes five days and five nights of full access to all three of the SONUS clubs, right at the beach. Minimum age for admission: 18 years. This ticket allows VIP access to Sonus Festival 2019 from 18th August - 22nd August. VIP ticket gives you access to the VIP areas in all 3 clubs, fast lane entries, separate bars, separate sanitary areas Minimum age for admission: 18 years. Already got your Regular Ticket but are looking for a special Sonus experience? No problem! The VIP Upgrade will transform your Regular Ticket into a VIP Ticket, allowing you to get all the VIP extras. Please note: ONLY valid in combination with a regular ticket bought on Festicket! Island Beats experiences will take you on a journey of handpicked, secret locations on the Croatian coast, attending the most sought after techno festival in the land. Sonus. Explore the real Croatia with picturesque spots and private parties only Beats Travel can show you. If you like the sound of visiting medieval towns and breathtaking National Parks during the day, followed by raves overlooking the beach at night, then you won’t be disappointed. Both our day and night parties will let you experience the vibrant character of Croatia like never before. Island Beats is the party that never stops. Day 1: Welcome drinks in Split and head up the cost to the town of Zadar. Check-in to accommodation and then a session with the Beats Travel DJs. Day 2-6: Sonus Music Festival and optional cultural day trips around the area. Day 7: Leave Novalja and head to Krka, one of Croatia's national parks. Last night of the tour but experience the famous Beats Travel leaving parties. Day 8: Goodbye! Moon Rocks Hostel is located in zone B and is within a 5-minute walk from the centre of Novalja and just a 5-minute ride to Zrće Beach. The hostel has 44 rooms ranging from doubles to shared dormitories and all include a safety deposit box, fridge, air-conditioning with some featuring a balcony with a sea view. Guests can enjoy a mixture of traditional and modern cuisine at the small Fifty Fifty restaurant and cocktails at the bar. Parking is free of charge. There is a supermarket 450 yards from the Moon Rocks, while the central area of Novalja is 550 yards away. Novalja Bus Station is 900 yards away. 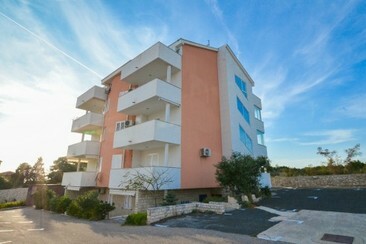 Your apartment will be located in Novalja, the second largest town on the Croatian island of Pag. Apartments have a combined kitchen-living area, bathroom and balcony. Zrće Beach, known as the Croatian Ibiza and venue to festivals, is nearby and can be reached by shuttle bus. All pictures are for the illustration of standards only. Drive to Zrce: 10 mins Bus to Zrce: 15 mins, runs frequently (every 15-30 mins at peak times) Please note that tourist tax in Novalja this year will be €1,35 per person per day and must be paid on arrival. 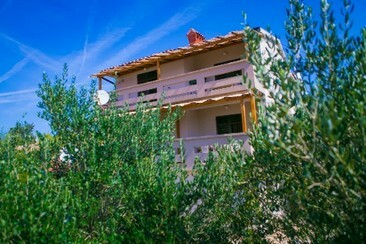 The apartments are located in Gajac, a small town close to Zrce. Gajac is a purpose-built accommodation village with a long spacious beach and plenty of bars, shops and restaurants. Apartments have a combined kitchen-living area, bathroom and balcony or terrace. Zrće Beach, known as the Croatian Ibiza and festival venue, is nearby and can be reached by shuttle bus. All pictures are for the illustration of standards only. Drive to Zrce: 5 mins Bus to Zrce: 10 mins, runs fairly frequently (every 30-60 mins at peak times) Please note that different countries have different standards so the 3* accommodation in Croatia may not be equivalent to the 3* accommodation in others. Please note that tourist tax in Novalja this year will be €1,35 per person per day and must be paid on arrival. Your apartment will be located in Novalja, the second largest town on the Croatian island of Pag. Apartments have air conditioning, a combined kitchen-living area, bathroom and balcony. The final cleaning fee is also included in the price. Zrće Beach, known as the Croatian Ibiza and venue to festivals, is nearby and can be reached by shuttle bus. Images are for illustration of apartment standards only, and do not represent your specific apartment. Drive to Zrce: 10 mins Bus to Zrce: 15 mins, runs frequently (every 15-30 mins at peak times) Please note that different countries have different standards so the 3* accommodation in Croatia may not be equivalent to the 3* accommodation in others. Please note that tourist tax in Novalja this year will be €1,35 per person per day and must be paid on arrival. The Vegas apartments are located near the city center and heart of Novalja. House is just a couple of meters away from Novalja's strip where all restaurants, bars, joints and local spots are located. Apartments are fully equipped with air conditioning, Wi-Fi (wireless Internet) and balconies. There are six apartments structured as apartments for 3, 4 and 5 people. Apartments are fully renovated, with modern furniture and flat TVs. Guest are free to use common room with a kitchen/ grill at the down floor of the house. House also owns a parking place for your car. Your apartment will be located in Novalja, the second largest town on the Croatian island of Pag. Apartments have air conditioning, a combined kitchen-living area, bathroom and balcony. The final cleaning fee is also included in the price. Zrće Beach, known as the Croatian Ibiza and venue to festivals, is nearby and can be reached by shuttle bus. Drive to Zrce: 10 mins Bus to Zrce: 15 mins, runs frequently (every 15-30 mins at peak times) Please note that different countries have different standards so the 4* accommodation in Croatia may not be equivalent to the 4* accommodation in others. Please note that tourist tax in Novalja this year will be €1,35 per person per day and must be paid on arrival. Ocean is a modernly furnished building just in the right spot – only 800 meters from the nearest beach and 200 meters away from the closest bus station which will help you get to your party destination in no time. The apartments being only 700 meters away from the center are located close to the main strip with many restaurants. 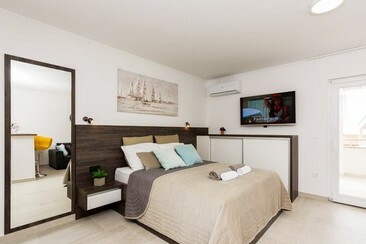 All Ocean apartments are studio apartments for three people and are fully equipped with air conditioning, wi-fi (wireless internet) and a balcony/terrace with a beautiful seating area for those summer nights. Guests can use the provided parking lot. Please note that different countries have different standards so the 3* accommodation in Croatia may not be equivalent to the 3* accommodation in others. The house consists of 8 apartments 4 apartments for 4 persons and 4 apartments for 6 persons. 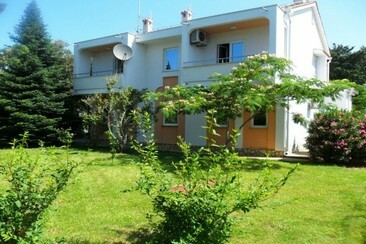 House is situated in the quiet part of Novalja, near to the main road. Apartments are equipped with air-conditioner, Wi-Fi, bathroom with shower cabin, kitchen utilities and they have parking places in the front of the house. Dining area with a table and chairs for all the guests is attached to the kitchen and living room. Every apartment has it's own balcony or terrace with table and chairs and some of the apartments have also a Seaview. Please note that tourist tax in Novalja this year will be €1,35 per person per day and must be paid on arrival. 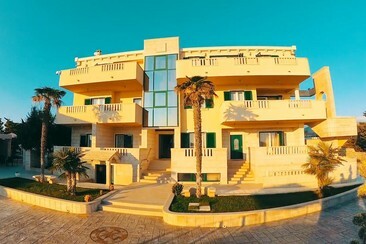 Lilly Apartment located in the city of Novalja, the second largest town on the Croatian island of Pag. Standard apartments consist of one or more large bedrooms, living room with sofa beds, dining area and equipped kitchenette, bathroom and a balcony or terrace. Wifi and air-conditioning is available. Car parking is available if you travel by car. 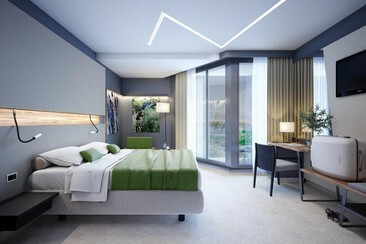 Premium apartments are newly built, bigger and more spacious. The centre of Novalja has array of shops, restaurants and bars, including supermarkets. Zrće Beach, known as the Croatian Ibiza, and Club Papaya, are only few kilometres from the apartments and can easily be reached by car or bus. Please refer to photos to see the difference between different numbered named apartments. Alchemy Apartment is located in the city of Novalja, the second largest town on the Croatian island of Pag. Standard apartments consist of one or more large bedrooms, living room with sofa beds, dining area and equipped kitchenette, bathroom and a balcony or terrace. Wifi and air-conditioning are available. Car parking is available if you travel by car. The centre of Novalja has array of shops, restaurants and bars, including supermarkets. Zrće Beach, known as the Croatian Ibiza, and Club Papaya, are only a few kilometres from the apartments and can easily be reached by car or bus. 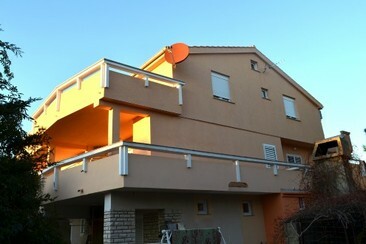 The apartment will be located in Novalja, the second largest town on the Croatian island of Pag. Apartments have a combined kitchen-living area, bathroom and balcony. Zrće Beach, known as the Croatian Ibiza and venue to festivals, is nearby and can be reached by shuttle bus. Drive to Zrce: 10 mins / Bus to Zrce: 15 mins, runs frequently (every 15-30 mins at peak times) Please note that different countries have different standards so the 2* accommodation in Croatia may not be equivalent to the 2* accommodation in others. Please note that tourist tax in Novalja this year will be €1,35 per person per day and must be paid on arrival. 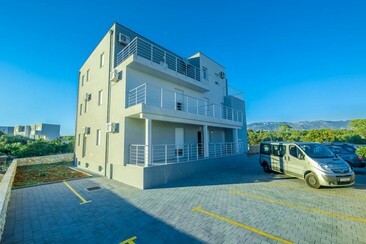 The Atrium apartments are located near the city centre and heart of Novalja. It is just a couple of meters away from Novalja's strip where all restaurants, bars, joints and local spots are located. Apartments are fully equipped with air conditioning, wi-fi (wireless Internet) and balconies. There are six apartments structured as apartments for bigger number of people ( for 6, 7, 8 and 10 ). Apartments are fully new, with modern furniture and flat TVs. Units are fitted with a kitchen and a seating area. Guest are free to use garden with a grill behind the property. House also owns a parking place for your car. Please note that tourist tax in Novalja this year will be €1,35 per person per day and must be paid on arrival. Your apartment will be located in Novalja, the second largest town on the Croatian island of Pag. Apartments have a combined kitchen-living area, bathroom and balcony. Zrće Beach, known as the Croatian Ibiza and venue to festivals, is nearby and can be reached by shuttle bus. Drive to Zrce: 10 minsBus to Zrce: 15 mins, runs frequently (every 15-30 mins at peak times) Please note that different countries have different standards so the 4* accommodation in Croatia may not be equivalent to the 4* accommodation in others. The best way to get to and from the Festival each day. - Unlimited bus rides to all festival locations - The cheapest way to travel around the island - The easy, reliable and safe way to stay connected - Less queues with shuttle wristband - Avoid overpaying for taxis, no parking fees. A private airport transfer from Zadar / Split / Zagreb / Pula / Dubrovnik Airport to Novalja. A shared airport transfer from Novalja to Zadar Airport. A shared airport transfer from Zadar Airport to Novalja. A shared airport transfer from Novalja to Split Airport. A shared airport transfer from Split Airport to Novalja.